With a suitcase and an umbrella; this is how our much awaited trip began as a group left from Macael to meet up with the members of the Home in Alcalá de Guadaíra. Six ladies and four Servant Sisters left Macael (Almeria) on a Saturday around 8:00 in the morning to have a get-together in Alcalá de Guadaíra (Seville) with the lay members and Servant Sisters in this community. In our suitcases and in our hearts we brought with us all of those who were unable to accompany us for different reasons and we had them present in each moment. 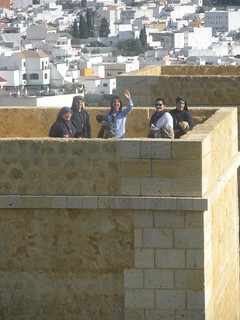 We visited the medieval castle in that area and the Shrine of Our Lady of the Aguila. There we had a wonderful time talking and laughing, praying the rosary before the statue of Our Lady and putting all of our intentions into her hands. In the evening, the “Little Aguila”, as the people of that town fondly call their patron, had a surprise prepared for us. Through a fun game that we played, Our Blessed Mother encouraged us to not give up or lose hope in the midst of difficulties, and that we should trust fully in Her and in her Son, even if we are trusting in blind confidence. Now we know, we should never let go of the cord, I mean, of her hand until we get to the end. 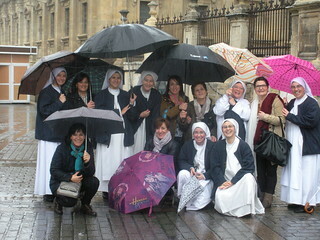 On Sunday morning we enjoyed a beautiful walk around Seville and good thing we had our umbrellas on hand! But as the rain soaked our clothes, our souls were also being soaked with graces as we visited different holy places such as the Basilica of the Macarena and the tomb of St. Angela of the Cross. When we got back to Alcalá there was a wonderful lunch waiting for us, prepared by the members of the Home of the Mother who poured out their generosity upon us. We had some time to talk to each other after lunch, getting to one another and sharing our experiences. It was hard for us to say goodbye, and we all feel that these encounters help us grow in so many ways and that they fill our souls with peace. Thanks to our Blessed Mother who made this trip possible and thanks to all the people who welcomed us with their arms wide open. The group from Macael hopes to be able to give back generously everything they received from the members of the home on this trip, when the members from Seville make a trip to the Land of Marble and Our Lady of the Rosary (Macael).